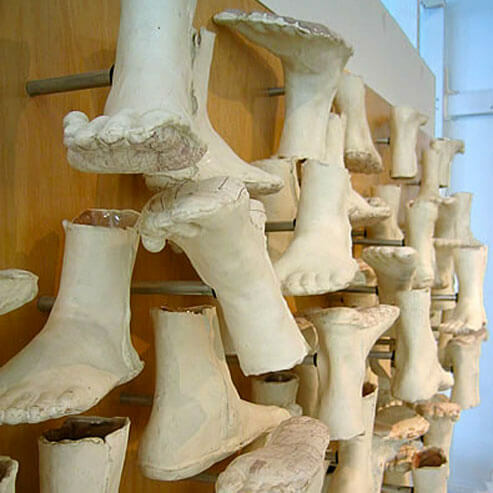 Frederick Bartolovic studied ceramics as an undergrad at the University of Arizona in 1994 under Professor Aurore Chabot. It was there that the cultural and historical importance of clay, as well as it’s potential as an expressive and contemporary art medium came into focus. After completing his BFA he worked designing, marketing and assisting in the operations of a handmade ceramic tile company in New Hampshire. Though rewarding in experience, Frederick sought out more ideational pursuits and returned to get his MFA at the Rhode Island School of Design in 2004. Since then he has founded Geocorpus studios; a collaborative art studio, and taught for three years at the State University of New York in Oswego, NY. In 2011 Frederick started directing the ceramics area in the Visual Arts at the Chautauqua Institute in New York, a summer residency program for students studying art across the country. In Fall of 2011 Frederick ironically returned to the state where he was born, “wild and wonderful” West Virginia, taking over the ceramics area at Marshall University. I am a designer, impelled to have my hands busy creating something all the time. My studio is a conceptual playground. I imagine it as a laboratory prone to happy accidents and experimentation that often bears fruitful ideas. It is the place where I feel most at home in the world, creating or making something. Ceramics is an entry point for me, and I am inspired by the multiple ways in which this medium lends itself to form. My background has wed me to the clay, and it is an initiator for traversing the conceptual realm, invoking memory and exploring emotion. My ceramic sculptures are derived from the human form, accelerating into queries about movement through space and our relationship to landscape. The work is idea based dedicated to an intellectual exploration of human affect, and psychology. I find myself intrigued by the convergence of physical and mental landscapes, and the relationship that these two realms share. Collective emotion generates action forging new paths (figuratively and literally) which either culturally link us together or separate us. I visually realize these bonds (or lack thereof) though creating multi-part assemblage sculptures which exemplify the interconnectedness of humankind. In this way the work is personal, yet often anthropological, and at times political within a larger context. In each piece I make multiple ceramic units, (something I can’t seem to leave behind since my industry experience in tile). Usually made with molds and/or using the potters wheel, multiple units create a fabric or texture to begin layering meaning onto. Multiples also evoke issues of obsession and mass production, while raising questions about matter produced and disposed in our culture. To further the cultural questioning, I am compelled to often glaze objects white or use the natural coloration of porcelain clay bodies. The reflection of all hues creates an antiseptic wash that teeters somewhere between moral objectivity and formalistic modernity, while the naturalness of the clay connotes dependance and connectedness to the Earth, something unique and innate to the medium of clay. This balance is central to the work. I then apply decals to help contextualize the pieces, layering different references and meanings. Abstract diagrams, schematics, mapping imagery, and drawings that I generate get amalgamated onto the surfaces. The process I employ facilitates a design aesthetic within the work and formally creates a balance between the more random and chaotic cone forms, juxtaposed against the thin rigid decaled diagrammatic lines. The individual units are then added up and installed together creating often much larger assemblages. A dance ensues which vacillates between the landscape of the mind, and the psychology of the landscape, and the order and chaos existent in both these realms.